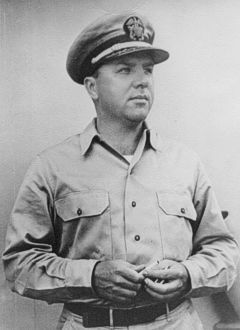 Commander Baron Joseph Mullaney, USN. Hugh W. Hadley (DD 774) was launched by Bethlehem Steel Shipbuilding Co., San Pedro, Calif., 16 July 1944; sponsored by Mrs. Hugh W. Hadley, widow of the namesake; and commissioned 25 November 1944, Comdr. L. C. Chamberlain in command. After intensive shakedown training off the coast of California, Hugh W. Hadley sailed 21 February 1945 in company with HMS Ranee for Pearl Harbor. The ships arrived 27 February, but Hugh W. Hadley was soon underway again, sailing 8 days later for Ulithi and the great Okinawa invasion. The ship departed in company with a large group of LST's and their escorts 25 March bound for the Japanese island stronghold, and arrived off the Okinawa group 31 March. As the night approach was made, Hugh W, Hadley led a group of LSTs toward the beach, shooting down an attacking Japanese plane en route. The destroyer escorted her charges safely to the beach, watched them unload their troops and equipment the morning of 1 April, and then took up antisubmarine patrol station outside the transport area. As the bitter fighting ashore continued, Hugh W. Hadley helped protect against submarines and aircraft as the Japanese made a final effort to stop the invasion. The ship remained on patrol until 4 April, when she sailed with a group of transports to Saipan, arriving 14 April. Hugh W. Hadley was soon on her way back to Okinawa, however, and arrived from Saipan 27 April to resume her outer patrol. For the next few days the destroyer fought off numerous air raids, picked up a downed fighter pilot, and carried out antisubmarine patrol. She went alongside destroyer Brown 1 May for transfer of communication equipment, and then took up additional duties as a fighter direction ship for the Combat Air Patrols, so vital to the invasion's air cover. As radar picket ships were scarce, Hugh W. Hadley was assigned this duty on the afternoon of 10 May. Joining destroyer Evans (DD-552) and four smaller craft, she took station 15 west of Okinawa and early the next morning began vectoring aircraft to meet the oncoming Japanese. For nearly 2 hours the morning of 11 May, Hugh W. Hadley and Evans came under severe attack, as the Japanese mounted their sixth attack against American forces at Okinawa. Both ships maneuvered at high speed, downing many suicide planes and directing air attacks on formations of Japanese. The attackers numbered some 150 planes. After Evans took several serious hits and went dead in the water about 0900, Hugh W. Hadley fought on alone. At 0920, she was attacked by 10 planes simultaneously, from both ahead and astern. The ship destroyed all 10, but not without damage to herself. One bomb hit aft, a baka bomb hit, and two kamikaze crashes were inflicted on the gallant ship as her gunners ran low on ammunition. Finally, as the attack ended, all but 50 of the crew were ordered over the side in life rafts, the remaining men fighting fires and working to control the damage. Though her engineering spaces were flooded and she was badly holed, Hugh W. Hadley was kept afloat by the determination and skill of her damage control parties and eventually arrived le Shima. During this remarkable battle, Hugh W. Hadley had succeeded in downing some 23 enemy aircraft and aided in splashing countless others. After temporary repairs, the ship was taken to Kerama Retto 14 May, where men from repair ship Zaniah worked on her battered hull. Hugh W. Hadley subsequently was taken to Buckner Bay, Okinawa, in a floating drydock towed by Avoycl (ATF-150), 15 July 1945, and after 20 days there began the long voyage under tow to the United States. After encountering heavy weather during the passage the ship arrived Hunter's Point, California, via Pearl Harbor, 26 September 1945. Decommissioned 15 December 1945, she was sold 2 September 1947 to Walter W. Johnson Co., San Francisco, and scrapped. In addition to one battle star for her World War II Service, Hugh W. Hadley received the Presidential Unit Citation for her performance in the action off Okinawa 11 May 1945.